With summer in full swing we would like to stop and smell the flowers. It is this season in specific that flowers, both wild and nurtured, show off for the world with their beautiful colors and amazing array of shapes and patterns. 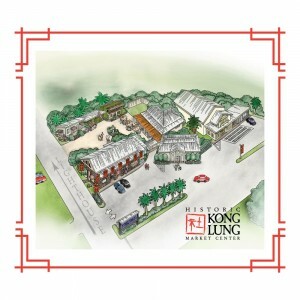 It is sort of like Kong Lung Trading itself—an incredible array of colors, shapes, sizes, textures and patterns. Stop in to Kong Lung Trading today to see the flowers, smell the flowers, try on the flowers or even have a few flowers gift wrapped. 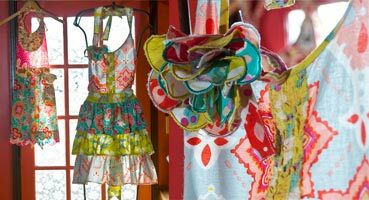 In the late 90’s public interest in dresses declined and as Renee Claire was delivering what she considered to be her last collection of dresses to a retailer, she saw a pair of pajamas in the window of the boutique. She quickly realized that current pajama offerings lacked sophistication and tailoring. As a consequence, BedHead was born. All BedHead pajamas are locally cut and sewn in glamorous Los Angeles, and sold at Kong Lung Trading in not-quite-as-glamorous Kilauea. Douglas has been a family-owned business for over 50 years (since 1956). They are the epitome of “Old New England Work Ethic” and some of the staff have been with them for 20 and 30 years. Success comes from unique designs and high quality materials and craftsmanship. The plush animals have gestures and expressions that clearly distinguish them as Douglas. The faces evoke a sense of endearment and the totes scream FUN! Tori Richard was founded in 1956, in Honolulu, Hawaii. Tori Richard, Ltd. is still today a family business driven by an appreciation of unique fabrications and globally inspired prints. The artwork that informs our textiles is our passion. A Tori Richard is like no other garment. It is their legacy and honor to create each exclusive new edition to be a delight to the eye, a pleasure to the skin, and a joy to the spirit. 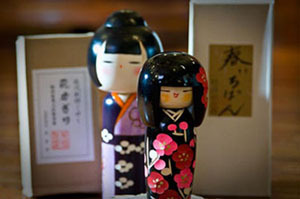 Kokeshi dolls, such as these flowered versions, are handcrafted wooden folk art dolls made by Kokeshi artists in Japan. The artists and their families share their passion for the beauty and uniqueness of the Japanese craft of Kokeshi dolls. Each kokeshi doll comes in its own box with the artist’s information in Japanese on the box. The package itself makes a lovely presentation. 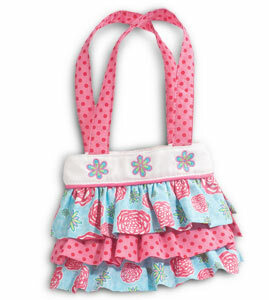 Super fun, bright and playful patterns fill these aprons, oven mitts and dish towels. Funktion also offers beach bags, laundry bags, hobo bags and tablecloths. 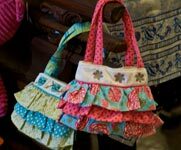 There is nothing as wonderful as spending those summer holidays cooking side-by-side with your daughter in matching mom & me aprons. The best of Paula Pryke’s classic and contemporary floral arrangements—in an accessible format to inspire novice and expert alike. Paula Pryke is unsurpassed in creating floral arrangements. Included are her signature contemporary designs as well as old-fashioned bouquets with a modern sense of color and form. Packed with ideas, skills, and techniques, this book explores the latest trends in floral design and encourages readers to let their personal style flourish with step-by-step instructions. Gorgeously illustrated, this compilation is an invaluable catalog of ideas and inspirations. 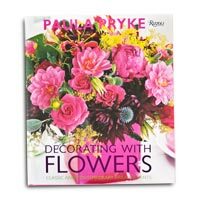 Decorating with Flowers by Paula Pryke $24.50.